Archery is one of the oldest sport continuing from Stone Age by Egyptians and is still practised today. During the period of the sixteenth and seventeenth century, the longbow was used as a weapon of war. However, by the end of eighteenth-century archery was started to be considered as a most vulnerable pastime among the English patricians. Later archery societies were developed across the country, each with their own rules and costumes. By the year 1840 archery was considered to be an exquisite exercise which also taught the unique ability to the people. Many Majesty’s of that time practised archery. But when Queen Victoria sat on the throne, it was considered as Golden era. She pursued archery as her hobby and also felt the necessity of women’s attention for this sport as they are very well worthy of it. By this, she captured the heart of many people. After this archery set upon like a wildfire, flaming across the womanhood of that century to be their first competitive sport without losing their feminism. In 1833, Princess Victoria Cofounded the Society of St Leonard’s Archer and was delegated as its patron. She then renamed it as the society of The Queens St Leonards’ Archer in 1837 when she proclaimed the throne. In this era, archery provided women to participate in general pastimes offering them freedom from daily household chores, playing the piano, reading books or needlework. Outdoor sporting was welcomed considering it as a great opportunity. They brought excitement back to their life either via horse riding or crochet or tennis, although informal but socially appropriate. But they enjoyed archery most out of all these activities. The first archery meeting was held by archers of Ireland and Great Britain in York in1844 named as The Grand National Archery Meeting after which archery assumed its position as a national pastime. After this every year, it attracted many bowmen and bow-women, who with their persistence and great effort brought this art to perfection as much as possible and occupied themselves with exceptional accomplishment in this field. Archery established as favourite British pastime under the surveillance of Grand National Society and has been conducted through all stages of revival. 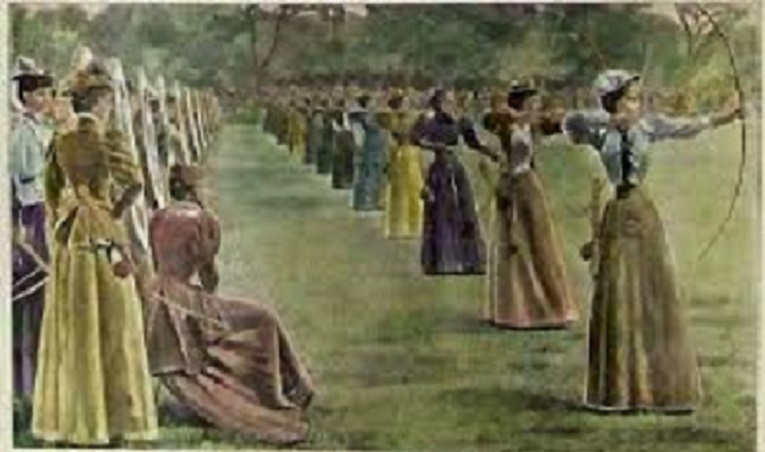 By the year 1845, ladies started to official participate in the National at some of the matches without any hindrances. As many as 130 archeresses have taken part in the competition against the equal number of men archers, guaranteeing the prize of about 400 pounds. In 1866, in Norway where Grand National Meeting was organized, the first prize rewarded was a marvellous Spitalfields silk shawl, a coveted item. By the year 1880, archery clubs in America were found at every coast almost, but the equipment needed to join them were only afforded by wealthy women. As there were various variants in archery, it became absolute necessity to set rules for the shooting of archery. Hence the “York Round Club” was founded on the basis of which all the archery competitions were conducted for archers. With this arrangement relative capability of archers that lived in three different kingdoms were measured without any uncertainty. The Grand National Prizes for good and central shooting were then allotted either by the result of two days shooting or by Double Round shooting depending on the “Value “they attained. The total gross point will be 10 in all. The composer of “The Theory and Practice of Archery”, Mr Horace A Ford won the Champion title by making the highest score of 1251 with 245 hits in 1857 at Cheltenham. He won the gold medal of Britain as maximum as 11 times and is one of the finest shooters in England, having unparalleled victory and shots till the date. No one has ever scored like him in archery. The nearest anyone could reach was a score of 955 by Major Fisher in 1871. He then remained champion in the consecutive years from 1871-1874. The champion from Scotland, Mr Peter Muir, scored 845 in 1863. The women champion, Mrs Horniblow made a victorious score of 764 in 1873 at Leamington. She had won lady champions bracers as many as ten times. She proved that besides being gracious women are evidentially capable, possesses many skills and talents. They can not only use the bow as a weapon but also to show the capability of their hands.